At 11:15 p.m. on March 2, 1945, Lt. (jg.) 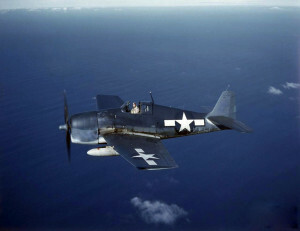 Kenneth B. McQuady, age 21, took off from Charlestown Auxiliary Naval Air Station in an F6F-5N Hellcat, (Bu. No. 71418,) for a night training flight. 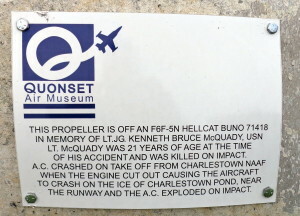 Just after he became airborne, his aircraft was seen to lose altitude and crash on the ice covered water of Charlestown Pond at the end of Runway 22. Upon impact the belly tank ruptured and caught fire. The plane bounced another 100 yards before coming to rest. Lt. McQuady received fatal injuries. Lt. McQuady is buried in Wildwood Cemetery in Bartow, Florida. 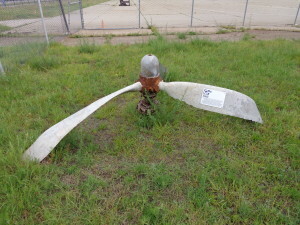 The propeller from Lieutenant McQuady’s Hellcat was recovered years after his accident and presented to the Quonset Air Museum and made into a memorial. Unfortunately, since this original posting, the Quonset Air Museum has closed.